A great fan of crusty breads, I’m normally no friend of dinner rolls. I had them sometimes in restaurants, soft, bland and usually so pale that they seemed almost under-baked. I could never really understand why anybody would prefer to eat these fluff balls with their dinner instead of a nice crispy baguette. But, fortunately, my baking friend Hanaâ prompted me (again) to overcome my bias against seemingly weird American predilections – with the Buttery Pull-Apart Dinner Rolls from Abigail Dodge’s “The Weekend Baker“. What I like about the book are its practical make-ahead instructions. Being convinced that even enriched doughs benefit from long fermentation, I followed Abby Dodge’s suggestion (option 1), mixing the dough in the evening, and letting it rise slowly in the refrigerator overnight. I made some changes to the original recipe. In my experience 5 g instant yeast (instead of 7 g) is sufficient for this amount of flour – the dough, even a rich one, will rise well. Since I like substituting some whole grain for white flour, I also replaced 68 g of the all-purpose flour with whole wheat (adding 16 g water to the dough to make up for the whole grain addition). The amount of sugar in the recipe seemed rather high, so I reduced it by half (to 35 g). I opted for the poppy seed version, adding 2 tablespoons instead of the measly one. And I mixed all the seeds into the dough, instead of sprinkling them on top of the shaped rolls – I knew from experience that those seeds would fall right off after baking, if there is no egg wash to make them stick. As with the other recipes I made from “The Weekend Baker”, this one turned out really nice. The rolls were very flavorful, slightly sweet, with a nice crunch from the poppy seeds – and they looked very pretty, too. And if you can’t eat them all? No problem, they freeze really well, first wrapped in plastic foil, and then placed in a freezer bag. In bowl of stand mixer, stir together flours, yeast, sugar, salt and poppy seed until well blended. With dough hook, on medium-low speed, slowly pour warm liquid into flour mixture. Add egg yolks and water. Mix until all flour is hydrated. Increase speed to medium-high, and knead for ca. 5 minutes. Dough should be very smooth, and clear bottom of bowl. Place dough ball into lightly oiled container with lid, turning it around to coat. Cover, and let dough rise 1 1/2 times its original size, then refrigerate overnight. Lightly grease a 9 x13″ (23 x-33 cm) Pyrex baking dish. Transfer dough to (unfloured) work surface. Divide dough into 16 equal pieces (using a scale), covering them with plastic wrap. To shape rolls: take one dough piece (or two, with both hands), place on dry work surface, and, with cupped palm, roll it with gentle pressure in tight circles until it forms a taut ball. Place rolls, seam side down, in prepared baking dish, spacing them evenly. Mist with spray oil and cover with plastic wrap. Preheat oven to 375ºF/190ºC. Let rolls rise in a warm place until they have grown ca. 1 1/2 times their original size, 45-60 minutes. Bake rolls for 10 minutes, rotate dish 180 degrees, and continue baking until they are well browned, 10-15 minutes more. Remove rolls from oven and brush with melted butter. Serve warm. Wonderful rolls! I love those poppyseeds! Your rolls looks wonderful! 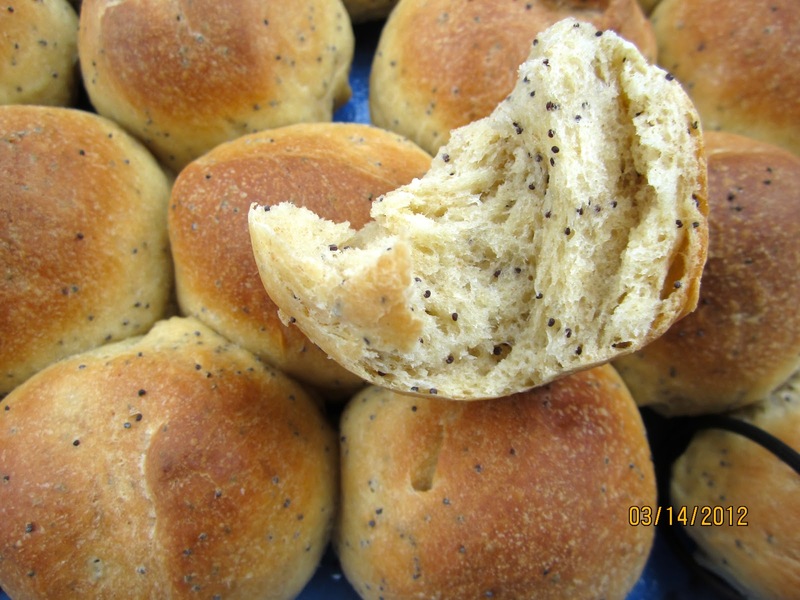 I made mine with poppyseeds too, the rolls are really soft, fluffy and tasty! Will be making them again! These look great, Karin. Great idea on adding the poppy seeds to the dough instead of sprinkling them on top. I remembered to reduce the yeast from your email but for some reason, I remembered the amount wrong. I remembered 7 gram instead of 5 gr, ha ha. Will definitely reduce the yeast some more next time. I'm sure your overnight fermentation gave it even more flavor, and will definitely try that too. I too like the look of add-in poppyseeds, you had a great batch of rolls! Janis, I thought about it, too. But this dough is very enriched, with half and half, butter and 3 egg yolks, so that the crust will be semi-soft, and steaming is optional. Enriched breads I would usually steam, nevertheless, but these dinner rolls are also glazed with butter after baking. The crust was actually not really soft, but very thin, and a little crisp, quite nice. Me, too. I'm quite pleased with the $4.95 I spent on the book – everything I made so far turned out nice. Danke, Hanaâ! We came back Monday, and had a great time (check out the next blog post). I had some frustrating experiences, trying to use seeds as topping without egg wash. They look great when the breads come out of the oven, but soon as you touch them, they fall right off. Without your challenge I probably would have never made dinner rolls (or cinnamon buns), but they are so nice. And you are right, I'm sure the cold fermentation improves the taste.